Buddying up to learn empathy, generosity, and forgiveness from the world’s most famous aardvark. ARTHUR image provided by WGBH, © 2017 WGBH. Underlying TM/© Marc Brown. Arthur, the longest-running children’s animated television series, has garnered seven Emmys and a Peabody award over the course of 20 seasons on PBS. Produced by WGBH in Boston, the series has been broadcast in over 80 countries, making Arthur Read — the series’ titular third-grade anthropomorphic aardvark — one of the world’s best-known cartoon characters. 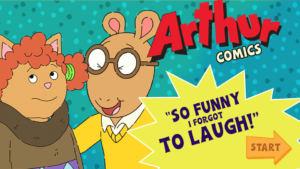 Throughout the show’s history, Arthur has explored childhood virtues, from love of reading to friendship. This legacy made the series a perfect match for a joint project between WGBH and Tufts University developmental psychologists. The Arthur Interactive Media Buddy Project created a series of interactive online comics designed to teach virtues such as empathy, forgiveness, humility, honesty, generosity, and learning from those who are different. The study adapted several storylines from the Arthur TV series but made them interactive, with pauses for children to consider what the different characters are thinking, choose the response the character will make, and see how the story then unfolds. In one story, when Arthur takes a joke too far and is accused of bullying his friend, students ponder the motivations for different characters’ responses and help Arthur decide whether to downplay the problem or to apologize. In addition to working with WGBH’s writers, animators, and programmers on the interactive content, Richard Lerner and Lacey Hilliard of Tufts designed and carried out a test of the program’s effectiveness in classroom settings. 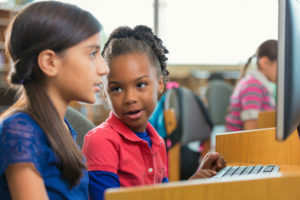 In a study that involved 1,155 first through fifth graders in 90 classrooms spread across nine schools, students were paired with a “buddy” from a different grade so that the older students could help the younger ones make their way through the curriculum. Some pairs used the Arthur curriculum; control groups either received no interventions or were given a reading curriculum to work through with their buddies. Hilliard also noted another striking effect of the Arthur stories: students who had worked through the series were more likely to say that their most important value was being a good person rather than getting good grades or being popular. Encouraged by their initial results, Lerner and Hilliard are now beginning to analyze more than 360 videos of buddy-pair interactions to understand the ways that students talk with each other about the interactive Arthur stories. They are also exploring other ways that the interactive Arthur stories can be used by non-peer pairings — especially parents and their children — to talk about virtues. For instance, Lerner and Hilliard are already exploring ways that the Arthur interactive stories can be used by military personnel overseas.